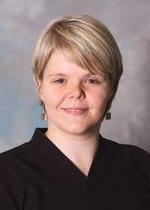 Kristin Swanson, PhD, professor of neurological surgery, is a pioneer in the field of mathematical neuro-oncology. A recent study by Kristin Swanson, PhD, professor of neurological surgery, illustrates the role in which a complex equation and novel algorithm can be combined to fight glioblastoma, the most deadly and aggressive form of brain tumor. The mathematical methodology produces a simulation similar to those used by meteorologists in predicting storms. But instead of calculating weather, it forecasts tumor growth, illustrating the expected course of the disease over time. The simulations have proven effective in demonstrating how doctors may be able to decrease radiation exposure to healthy tissue while increasing the treatment’s focus on tumors. The work was done in collaboration with scientists at the University of Washington in Seattle and Brigham and Women’s Hospital in Boston. Results of the study were published in PLOS ONE. Comparing the simulated treatment plan with current standard-of-care protocols, the lab showed that their model resulted in a 67-93 percent decrease in radiation dose to healthy tissue. Despite tremendous effort to improve the prognosis of patients with glioblastoma over the past five decades, very little progress has been made in improving the average survival time. “We’ve been stuck for decades with choosing a singular approach for most patients with brain tumors because we haven’t had the tools to say patient A should get this treatment and patient B should get this different option,” said Swanson, who holds a secondary appointment in the Robert R. McCormick School of Engineering and Applied Science. The study showed that the individualized simulations had a significant impact on delaying tumor progression in nine of 11 patients, while also decreasing radiation exposure to normal tissue. Swanson envisions producing the model as an iPad app so that clinicians around the world could enter specific data to calculate an individual patient’s expected response to specific therapies. The work was sponsored by the James D. McDonnell Foundation and National Institutes of Health R01 grants NS060752 and CA16437.